This piece was intended primarily as an audio/podcast experience. You can listen by clicking 'Listen to Narration', and/or read the transcript below. Hello listeners, Alan Bellows here, founder of Damn Interesting. This month, September 2015, we at Damn Interesting are celebrating our 10th birthday. Because we modern humans use a base ten numbering system, ten and multiples of ten naturally feel like big milestones. But base ten is actually a pretty poor base for a numbering system, having only a few divisors—1, 2, and 5—so when we do mathematical division we very often end up with messy fractions. Probably the only reason use base ten is because we happen to have ten fingers. Twelve would be a much better base, because it has 1, 2, 3, 4, and 6 as divisors. Sorry metric system. Ancient Egyptian and Babylonian mathematicians used a base 60 system, which has ten divisors, and it is therefore very easy to cleanly subdivide. There are lots of stories out there regarding ancient civilizations and their access to superior technology, and most of those stories are nonsense, but at least some of those ancients had a nice counting system. Their base 60 mathematics is why we have 60 seconds in a minute, 60 minutes in an hour, and 360 degrees in a circle. Anyway, as I was saying, this month is our tenth birthday. If you’re a trivia person, you may be aware that the song Happy Birthday to You—despite being over a hundred and twenty years old—is a copyrighted work, subject to steep licensing fees. The song was written by sisters Patty and Mildred Hill in 1893. The rights to the song have changed hands in the century since, and it is currently owned by Warner/Chappell Music. They earn over $5,000 per day in royalties—over $2 million per year—for a song written by a pair of American sisters 27 years before women in the US could even vote. So how were we able to afford to license it? We weren’t. The less well-known bit of trivia is that only the lyrics of the song are protected by copyright. The tune itself was recycled from an earlier song entitled “Good Morning to All,” which is in the public domain. It’s a bit like how the alphabet song and “Twinkle, Twinkle, Little Star” use the exact same tune. Just in case you weren’t aware of that, I’ll pause for a moment so you can hum it to yourself. So, since we did not play the lyrics to Happy Birthday to You we are exempt from any licensing fees (nevermind the fact that the title of the song contains 88% of the lyrics [94% if your friend happens to be named “Happy”]). It all may soon be moot anyway. In 2013, documentary filmmaker Jennifer Nelson filed a class-action birthday suit against Warner/Chappell, claiming that the lyrics also belong in the public domain. Her team found a tattered 1922 book titled “The Everyday Song Book”, which included the Birthday song with no claim of copyright. Evidently, in those days, failing to assert copyright was the same as giving it up. If the courts decide in Nelson’s favor, Warner/Chappell will be required to refund all of the ill-gotten royalties collected for the use of Happy Birthday to You since 2009. Update: All of that was true until last night. On 22 September 2015 a US federal judge ruled that Warner/Chappell does not have a valid copyright to the lyrics of Happy Birthday to You. Way to go, Jennifer Nelson. Damn Interesting has always been an evenings-and-weekends project for us. We all have day jobs since Damn Interesting doesn’t currently bring in enough income to make a living. This makes our posting schedule somewhat erratic, especially considering the unpredictable amount of time needed to research, write, edit, fact-check, record, and produce each article and episode. I often get emails and comments informing me that Damn Interesting would be better off if we posted new content on a regular schedule, even if the interval was long. But this advice ignores years of research in operant conditioning. Psychologist B.F. Skinner famously used operant conditioning chambers where various animals could be subjected to rewards and punishments—such as food pellets or electrical shocks—to determine which stimuli most successfully shaped behaviors. This research showed that rats will keep pulling a food lever almost without end if the chance of receiving the desired pellet is totally unpredictable. This same operant conditioning can be observed when humans pull levers on slot machines. Not to imply that Damn Interesting deliberately employs unpredictability in our posting schedule, just that a regular schedule would not necessarily be better. The first story is introduced and presented as all stories will be: a mixture of voice-over taken from the story articles, photos and video when available, and entertaining reenactments (with creative license liberally taken). Interviews are conducted of experts and tangentially related celebrities. For example, for the “Number Stations” article, military experts will be consulted, stock footage of radar stations and radio towers used, and Russian comedian Yakov Smirnov will be asked what his role in this mystery was. The small but enthusiastic audience (and sometimes a particular “man on the street”) yells “Damn Interesting!” at the conclusion of each story. They will also add overly big oohs and aahs to punctuate the interesting elements. Yikes. To this producer’s credit, he was receptive to our feedback, and he scraped most of the cheese off of the pitch before sending it out to the networks. Initial responses were positive. Producers seriously suggested Christopher Walken, Jeff Goldblum, and David Duchovny as potential hosts. But the networks all wanted to adapt the show for a broader audience. They wanted to replace much of the rigor and skepticism with “irreverence” (the word they use for “crap” in the moving picture business). I was unwilling to lend our name to such a second-rate production, not even for potential fame and fortune. This was not the last TV producer to reach out to us, but until recently networks all balked at the notion of respecting the viewers’ intelligence. However the trend toward trash appears to be finally abating in recent months, and there is a noticeable resurgence in interest in intelligent video content. We are in early talks with some producers that may lead to something worthwhile, we are cautiously optimistic. I have never cared for paid advertising. It is such a strange mode of communication. Why should it be acceptable for me, as a website owner, to sell your finite attention to some self-interested third party? This is especially true in online advertising, where the third party can often track your movements around the web and use that data in opaque ways. Furthermore, advertisers have an insidious influence on the content they finance, causing editors to consciously and unconsciously shy away from anything the corporate backers might find controversial. So, we decided on day one that we would never finance the site with ads. At first I just paid expenses out of pocket, but as our audience grew and our hosting costs increased, I created “Damnload,” a system where readers and listeners can help us remain in operation in exchange for exclusive e-books and audiobooks and stuff. So far, most months, our costs have been covered. Sure, I’d prefer it if our costs were covered every month, but you know, rats and pellets. Technically we did have some third-party advertisements on the site in November 2008, but in our defense, we did not put them there. These were ads for illicit pharmaceuticals and online gambling that had been inserted by hackers from Russian IP addresses. They found a vulnerability in our WordPress installation and it took almost a month of troubleshooting, investigating, editing, and buttressing before I finally defeated them for good. If you run a WordPress site and you have any trouble with hackers, drop me a line and I can give you some tips. Workman's proposed cover (top right) and Alan's suggested alternatives. If you’re a long-time reader of Damn Interesting, you probably already know about this, but you likely don’t know all the details. When we launched the site we had plans to eventually publish a series of tasteful books, because for some reason we authors have a strange inclination to see our words printed on dead trees, stacked on shelves made of dead trees in a physical building made, at least in part, of dead trees. Sorry trees. This plan came to fruition in 2007 when Scott Adams—the inventor of Dilbert and an author I admire—linked to one of our articles from his Dilbert Blog. I emailed to thank him for the link, we exchanged some pleasantries, and he referred me to his literary agent. We put together a proposal, and within two months we had a $45,000 book deal with Workman, a large and reputable publisher. I naively assumed that Workman would respect our established “brand”, especially since an ongoing relationship was probable. But while we wanted a tasteful book series for intelligent readers, it turned out they wanted to make as much money as possible using methods we had always deliberately rejected: hype, exaggeration, and credulity. Unfortunately the contract gave them final say. Nevertheless we performed our editing responsibilities, which used surprisingly analog technology, such as huge stacks of paper drafts shipped through the mail. In the meantime I expressed my strenuous and ultimately ineffective misgivings about the cover and title they had designed. The day Alien Hand Syndrome was released, Jason and I sat through an 8-hour marathon session of publisher-arranged promotional radio interviews. It began at 4:45am local time, with occasional breaks to accommodate biology. By the time it was all over, we had given at least 28 interviews, but I lost count partway through. People often ask me how successful the book has been. It really depends on the metric. In terms of reception, it reviewed well—for instance, it has a 5-star average score on Amazon. In terms of profit, 15% of the advance went straight to the literary agency, and the remaining $38,250 was divided among the book’s thirteen authors, each one’s share equivalent to his/her contribution to the material. The average author share was just under $3,000. It has sold about 18,000 copies, far fewer than necessary for us to earn out the advance and start receiving royalties. I hope Workman at least broke even, but I don’t know. Speaking of the book, Jason and I did a few “Authorpalooza” book signing events where local authors gather at Barnes & Noble stores to meet fans. Near the end of one such event, a Damn Interesting fan approached us and asked us to autograph our book for him. I asked him who I should make it out to, and it was Brandon Sanderson, famed author of the most recent books in the Wheel of Time series. He was there as the star of the event. Jason had recognized him, but I had not. Sorry, Brandon. 577: The total number of posts we have ever published on Damn Interesting. This is an average of slightly more than one post per week—though this is heavily skewed by the much more frequent posts in our young and spry days. 363: The number of our articles that remain evergreen, and are therefore still included in our main catalog. 526,469: The number of words we have published so far. That’s a little over thirteen average novels’ worth. If we were to print all of those words in one long line on a strip of ticker tape and stretch it into outer space, it would be a terrible waste of resources. 16: The number of hours of audio in our Greatest Hits audio book so far. 26 million: The estimated number of humans who have seen at least one page on DamnInteresting.com. That’s a little over 45 Wyomings. 9: The number of people who have made serious bids to buy the entire Damn Interesting project. 1: The number of undiscovered Easter eggs on our site—”undiscovered” in the sense that no one has ever emailed me nor commented about it, unlike our other Easter eggs. Screenshot of Google Analytics in the midst of an unforgiving Reddit click storm. 6,680: The largest number of concurrent visitors on our server at a given moment. This happened recently, on 13 July 2015, due to a front-page post in Reddit’s “Today I Learned” subreddit. 70: The number of random people that need to be in a room for there to be a 99.9% chance of two of them having the same birthday. You would need 366 367 people to have a 100% chance of a shared birthday, but 70 is unintuitively enough for a 99.9% probability. This is known as the Birthday Problem. Think of it this way: It’s not about the number of people, it’s about the number of possible combinations of people. With three people, there are three possible pairings: AB AC and BC. With four people, there are six possible pairs: AB AC AD BC BD, and CD. With five people there are 10 combinations, and so on. With 70 people, there are over 2,400 possible combinations of people, hence the high probability that two share a birthday. 72: The number of Wikipedia articles that currently cite or reference a Damn Interesting article as a source. 0: The number of Wikipedia articles about Damn Interesting. There were a few other statistics that I was hoping to come up with, but I couldn’t compute an acceptable approximation: For instance, the number of teachers who have used our material in their classrooms; the number of advertisers who have asked to buy ad space on Damn Interesting; and the number of spam comments our server has deflected. The best I can say for any of those is: a lot. We hope you found this peek into our past and present at least moderately interesting. Thanks to all of you who have read, and listened, and commented over the years. And superthanks to all of the donors who have helped us keep the lights on. Damn Interesting is still an after-work and weekends project, but we recently upgraded our Damnload system to support recurring donations. My hope is that we will eventually accumulate enough small, repeat donors that I can safely retire from freelance web development—essentially my second job—which would more than double the weekly hours I can spend on Damn Interesting. So if you want to see more frequent content from us, the best thing you can do is become a recurring donor. It’s a cumulative effect, so even if you can only offer a tiny amount per month, it’s a tiny step in the right direction. We would like to dedicate this episode to Greg Bjerg, our good friend and Damn Interesting author who passed away in 2011. We’ve had a lot of authors come and go over the years, so I am reluctant to name names lest those omitted feel slighted. But to those of you who have helped Damn Interesting become the odd sort of success it is today, thanks for sticking around. This episode was written, narrated, scored, and produced by me, Alan Bellows. The music at the top was a parody of the Theme of The Muppet Show, originally written by Jim Henson and Sam Pottle. The tuba rendition of Happy Birthday to You was by Peter Opaskar of TubaPeter.com. To Josh & Chuck of the podcast Stuff You Should Know, Roman Mars of the podcast 99% Invisible, and our readers/listeners who sent in audio greetings and questions: Thanks for giving a damn. You guys are the cat’s pajamas. If you ever have any comments or questions regarding the podcast, go to damninteresting.com/speak for information on how to contact us, or just email podcast@damninteresting.com. Aside from donations to help us remain in operation, the best birthday present you can give us is to leave us a review on iTunes, and tell your friends about us. Word-of-mouth. Written by Alan Bellows, copyright © 10 September 2015. Alan is the founder/designer/head writer/managing editor of Damn Interesting. Podcast sound design by Alan Bellows. Podcast narration by Alan Bellows. Last updated 12 July 2017.
awww. Thanks and happy Birthday Damn Interesting. You are the coolest website ever! Gah, yes, of course. Usually when I talk about the Birthday Problem I say something like “ignoring leap years for simplicity’s sake,” as I did on my old article dedicated to this topic, but I neglected to do so here. Thanks. Do you think the success of shows like through the wormhole will help sell an intelligent damn interesting show? You’re creeping me out man. I spent a sleepless night earlier this night pondering what base the Galactic number system should be. I thought base 12 for having a larger number of divisors but still being small enough to be manageable. First, let me just say happy birthday to Damn Interesting. Next, I want to say thanks to Alan and all of the writers who have contributed over the years. It’s good to see that you guys have been able to keep at it. I have never been disappointed with an article. My personal schedule is at least as crazy as y’all’s and I don’t get to comment as much as I would like. I’m not young enough that typing on phone is easy and that is usually how I get the chance to read. As for a counting system, I vote for a base 17 system. Mostly just to confuse the hell everyone. Congratulations, gentlemen. Keep ’em coming for another ten years. Ha, I like how the stuff about the Happy Birthday song is already out of date. Base 10 isn’t terrible, it allows for decimal math, and for that reason has become mainstream for math and science. Obviously other base systems have different advantages, but base 10 has a pretty big advantage. I can’t believe that, in an article addressing numbering systems, I get to do this – 1st! Thanks for 10 Damn Interesting years! 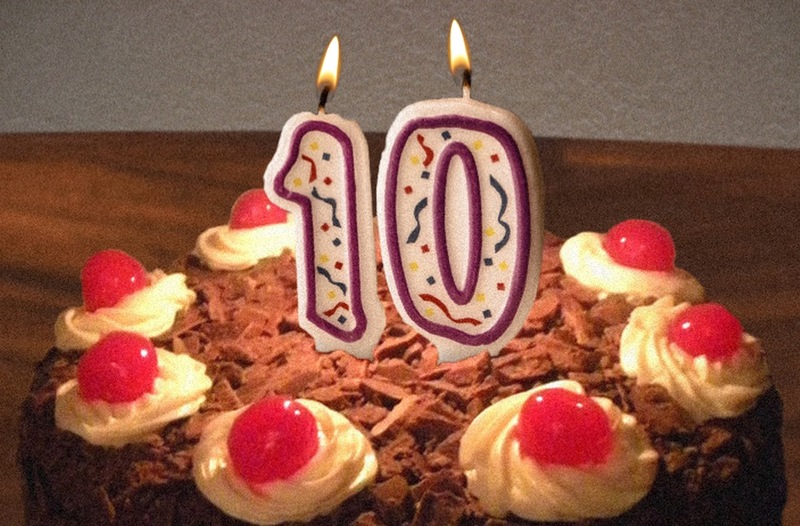 Hey Alan, Jason and crew congratulations on 10 years of one hell of a damned interesting online existence. I picked up on this page mid 2006 quite by accident as I started my new job. We had down time with breaks and lunch and I found the place. During those weeks I caught up to date and have stuck with it ever since. I’m sorry that your amazing book only moved 18000 copies as it’s pathetic so few could find it and enjoy reading the content. I am one of those few and I still have it as one of less than a dozen print (non manga/picture) books I’ve held onto. Perhaps you should consider selling an e-version of it through the website much like the compressed setup you have of the existing materials. On that subject I had wondered, what if you buy now, come back 6 months later to 3 more articles, can those be added into your existing buy or pay again? I hope for the best with this place going forward, and if that TV thing works out I’ll be there. TV stupidity aside in the old catch for it, a show like that even if I had not known about this site I would have watched for all the cool unknown bizarre truths of history. Many happy returns. In regard to base 12 systems, societies that used them didn’t count by their fingers. Instead they used the thumb on each hand to count the corresponding knuckles on that hand. Happy Birthday! I’m pretty sure I’ve read every single (active) article you guys posted. 363? Damn. Here’s hoping for another 10 years of Damn Interesting articles! It’s hard to believe that ten years have passed already. I first read about this site in mid-2005, thanks to Kim Komando. Komando provided a link to “Damn Interesting” as her “Cool Site of the Day,” and I have been hooked ever since. I also purchased a copy of “Alien Hand Syndrome,” and it is one of my prized possessions. It is one book that will never be donated to a library. Alan: Thanks for ten great years of Damn Interesting articles that not only entertained me but also continued my education. Best wishes, and have a damn interesting Happy Birthday! stat you missed for all of your fans out there…. 100%: the percentage of articles wherein a user has claimed to be the 1st to comment, and has been wrong! I like how you registered moderatelyinteresting.com when you posted this. I discovered your site today and I can’t believe you are here for 10 years and I did not know about it. I will surely recommend it to more people for interesting read. You indeed are Damn Interesting! Congratulations on ten years and thanks for the entertainment and interest in that time! I don’t remember just when I started reading DI, and (very) occasionally commenting thereon. 2005, maybe? A friend at work had found it and recommended its nifty information and presentations to me, and that was that. I of course bought a copy of Alien Hand Syndrome, and have tried to be a loyal reader (except when Real Life got in the way, as it is known upon occasion to do). Congratulations to Alan and all the DI team; long may your efforts thrive. Ad astra! Easter Eggs?????? 8-/ Where are they??? Just let me say Happy Birthday although I’m a little lat. Found you today through Pockets. I really enjoyed the things I read so far. Keep up the good work. So far I know of two teachers who have used Damn Interesting content in their classes: myself and a colleague. Thanks for all the articles over the past 10 years.